Once you’ve fought as a southpaw long enough, you’ll realize it’s always a game to see to who can land their back cross. It’s a bunch of feints, reach-ins, and pull-backs, before someone eventually lands their cross. Either the orthodox fighter lands his RIGHT cross or the southpaw fighter lands his LEFT cross. It’s almost like no other punch matters as much. It makes sense since it’s very hard to land hooks in orthodox-southpaw match-ups. The foot positions make it so that you’re either landing weak little jabs or big crosses. And it’s likely that whoever lands more crosses is probably winning the fight. The advanced counters I share in this guide will help you get beyond just thinking about the cross. It’ll help you get into positions to make your right hook a threat, which in turn, makes your left cross an even bigger threat! I’ll also show you some new angles to threaten with your left hand so that’s it’s not just a predictable straight left every time. There is the drawback of you being countered harder so you’ll have to deploy these tactics intelligently! This is so smooth and awesome, just walk it. Be casual with your footwork as you pop two left hands to his face while you move around his front foot. It shouldn’t be two full-blown left crosses but more like two quick lead lefts. The goal is to distract him so he doesn’t notice your position changing. Manny Pacquiao has done this numerous times throughout his career. The tactic works well against right-handers who are overly cautious of your left. If there’s any tip I could give you, it’s that you need to focus on keeping him busy with your double-left rather than trying to be quick with your footwork. Be quick up stairs and calm downstairs! The moment you get too explosive with your footwork, it’ll startle him and he’ll only back away. You want to sneak in on him so you can land other punches before he realizes where you are. Countering a jab with a hook seems so unlikely for many reasons. The first is because a jab is a longer weapon (straight arm) than a hook (bent arm). The second is because theoretically in an orthodox-vs-southpaw fight, your front feet are always colliding and preventing both of you from getting close enough to land your front hook. You’re most likely to get caught in a jab battle which prevents either of you from getting close enough for the hook. So how does the hook land? Simple! One clever tactic is that you DON’T throw your jab. Don’t establish your range. Don’t let him know you can reach him. Once he gets close enough, BOOM! You trade your hook for his jab. Now there’s one more little tactic to really make this work. What you do is dip your head down a little bit, you can even bend over slightly (towards the 10 o’clock direction), and then when he jabs down at you, just pop your head up and hook him in the face. Many great examples of this right hook counter as well as other tactics I shared in this post. This is also another unlikely angle. Typically in a southpaw-vs-orthodox situation, both fighters are trying to jab OVER each other’s jabs. It’s more natural for your arm to curve around each other on the outside, making it easier to evade AND counter an opponent’s jab this way. 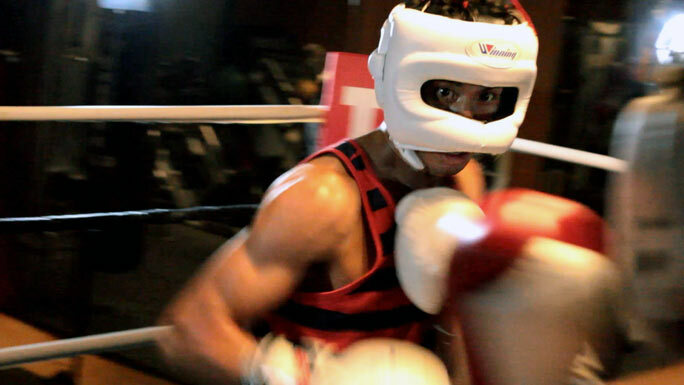 To jab on the inside (and UNDER) his jab, we’ll have to use a couple tricks. The first tactic is to dip your head lower and/or bend your knees a little when you jab under or on the inside of his jab. This prevents his jab from countering you over the top. The second tactic is to mix up your inside jab; there are two ways. METHOD #1) Sometimes you jab OVER his jab, sometimes you jab UNDER it. METHOD #2) Sometimes you jab inside to his head, sometimes you jab inside to his body. This type of dipping cross is so much harder to defend than you think. From the outside, it looks like you could be easily countered by an uppercut to the head or the body but that isn’t what your opponent sees. To your opponent, a dipping head can look like a punch to the head OR the body. And because he won’t know which one it is, you can throw that left anywhere you like. Try the head, or the body, or even somewhere in the middle…like the chest or solar plexus (perfect against defensive fighters). The dipping left to the head has several options as well; you can make it a straight left hand to the face or even a wild looping left hand over the top (Pacquiao-style). Like I said, it’s really hard to defend and your orthodox opponent will be exposed from many angles when he jabs at you. This is one of my absolutely favorite counter-punches to use in an orthodox-vs-southpaw fight. You can see Nonito Donaire knockout Vic Darchinyan with this exact punch. The momentum of your opponent’s head turning into his right cross matches perfectly with the momentum of your right hook coming from the side. The more aggressive he is, the more impactful your right hook. It is nearly impossible for your opponent to block your right hook when he’s throwing his right cross. The momentum of the right cross will rotate his face forward and naturally pulls his left shoulder back and away further exposing his face. His glove, if it’s anywhere near his face will more likely be in a relaxed position ready to throw the next punch rather than stuck tight to his face for defense. Even if he manages to cover his chin, his temple and the side of his head will still be exposed. If you know where to look and how to time it, there are just too many countering opportunities for you to hit your opponent during this right cross. So why then do more fighters not use this incredible counter? I’m guessing it’s not intuitive. 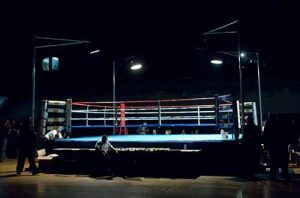 Boxers will typically defend and counter on the same side, preferring to defend and counter an opponent’s left hand with their right hand, and vice versa. Another reason is because throwing a right hook against an incoming right cross feels like you’re still vulnerable. It either feels like you’re not evading his punch and your head and body are still open, or if you’re turning away from his punch it feels like you’re exposing your back to him. My best advice is to stand your ground, be confident, and look for the right timing. The best timing is when you see his head turn forward during his right cross. (Many fighters will turn their heads ever so slightly to the left and right during their punches.) When you see a fighter turn his head into the cross, that’s the perfect time to land your right hook. The combined momentum can cause a knockout easily. But you have to be confident, be aggressive and put all your focus into the counter instead of thinking about evading/slipping his right cross. If you land your right hook well, his right cross will never come! Now if you absolutely want to throw this right hook AND move your head evasively, there are two ways. One is to simply turn your head/body away during your hook; just be careful of his cross landing on your jaw when you turn back. Another is to keep your chin down (maybe dip your head down a little extra) while throwing your hook. Your opponent throws a jab, and you dip forward with a quick left hand straight to the body and then pull out with a huge right hook to his head. We’re hoping he’s caught off-guard enough by your left to the body that he instinctively pulls his arms forward to defend leaving the side of his face open for your hook. It really doesn’t matter if your left hand lands, it’s just there to distract him! You can also do the opposite, try a straight left to the face and then side your right hook his body. This trick works so well! The southpaw left uppercut or left hook to the body is probably one of the least utilized shots in boxing. Many fighters feel vulnerable to head shots when they drop their hands for a body shot. This is especially the case when you’re a southpaw against an orthodox fighter; it feels like his body is too far away to reach and you’re also wary of his powerful right cross. So how do you make it work? FAITH! …just hear me out. So basically when your head is dipped right in front of your orthodox opponent’s right hand, it’s not as easy for him to throw a right hand at your head from there. I know, it sounds weird but it’s true. You head is at an awkward angle for him even though you’re so close and feel vulnerable. Anyway, the trick is to get your head to that position and throw your left uppercut or left hook to his body from there. You can leave your head in place as you rotate only your upper body (at an upward diagonal angle) OR you can turn your whole upper body and head to the right side (at a horizontal angle). Like I said, your head is less vulnerable from that position than you think! Now here’s the important note: your head HAS to be forward. You want your head to be somewhat directly in front of his right shoulder. I sounds REALLY RISKY, I know! I’ve taught this tactic to fighters before and what some of them did was lean their head BACK as if to try and be further away from the right cross. This is NOT RECOMMENDED as the extra space actually makes it easier for your opponent to land his right cross, and many knockdowns/knockouts have been caused this way! Man, I really like how he throws that left hand to the body. Sometimes as an uppercut, sometimes as a straight left. I can see how it’s devastating and very tricky to defend against (especially when you’re not sure if it’s going to your chin or body). I remember Lucian Bute used to throw many left uppercuts as a southpaw as well. Hey johnny . as a southpaw counter puncher, i found those tips very helpful although i don’t like the first one because it is so common most people including those i sparred with tried to throw it at me and every single time they get countered clean by a slip and counter left. Anyway, I’ve watched some of Conor Mcgregor’s fights and although he is an mma fighter, i found out that he has some decent counter punching skills for a southpaw (Conor vs eddie alvarez) . 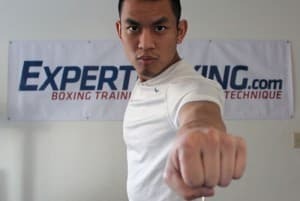 What do you think of his skills as a counter puncher and can you breakdown how he seems to counter right hands in a weird way without making much movement compared to other southpaw boxers ? Hi Anthony, the real answer is in HOW you do it and not so much WHAT you do. With that said, anything can and might work if done a little differently. I think Conor McGregor is alright but nowhere near the level of even amateur boxers. I would have to watch him a bit more to understand what he’s doing. From what I’ve seen, he looks like a good striker, good power, very unorthodox, and he outsizes many of his opponents. I think i read, that he had about 5 boxing fights before his mma Career. I just wanted to ask you . As a southpaw counter puncher who uses distance alot , how to deal with boxers who attack with lots of feints before even throwing punches? Mostly by switching stances as they are coming forward . Should i fire back as soon as they start moving forward or wait for the first punch ? I tried the last one and i payed heavily for it lol and at the same time i’m afraid that if i fired back he may tag me first or something like that . First off, he’s going to be hard to fight if he’s more experienced than you since he’ll keep readjusting to all your adjustments and he’ll do it faster than you. In other words, what you’re experiencing is normal. If you want to deal with boxers who feint a lot, you should try feinting with them, too…this way they never know what to expect from you as well. Do different things, change it up! Yeaup, I can’t imagine any other scenario except for maybe an agreement to extend for the whole 12 rounds instead of Floyd knocking him out in Round 1. Do you think you could write an article for grapplers trying to learn how to properly box? Habits they may have from grappling that may be detrimental in a boxing match, conceptual differences etc? This would be very fun to write, Ocean! Will do it.